A £54m bypass first proposed over 40 years ago to take traffic away from a Cornish village will be fully opened to vehicles on Friday. Work began on the A38 bypass more than two years ago to alleviate one of Cornwall's worst traffic bottlenecks. 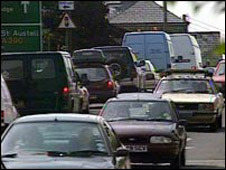 The Highways Agency said traffic in Dobwalls had reduced by about 90% since part of the road opened in September. It is also hoped the bypass will boost tourism and business by cutting journey times and improving reliability. The need for a bypass was first identified in the 1960s when large traffic queues began building up through the village. It was finally given approval in August 2006 after a public inquiry. Traffic has been restricted to one lane on each carriageway of the new road since September, but both westbound lanes were opened on Thursday night and the final eastbound carriageway will open later. Highways Agency project manager, Simon Kirby, said: "Travellers on the new road will notice a marked improvement in journey times while the people in Dobwalls will reap the full benefits of their long-awaited bypass."